Love will Make America Kind, Again! If only 45-50% of those eligible voted, it would be closing in on midterm records set in 1970 when 47% voted, and 1966 when 49% voted. We can beat this! We. Can! But not without your help. Vote. Vote. VOTE! Please, get everyone you know to vote, it’s really that important. Lives depend on it. The future depends on it. If we all vote, and get everyone to vote, we can change the world! Let’s break the records with astounding numbers. Let’s do this!! VOTE! And always, always, Vote Love!! We regularly post on our Facebook page and are adding videos to our YouTube channel. 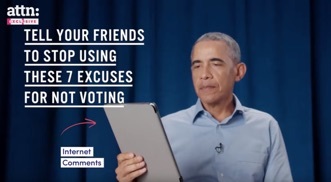 https://www.vote.org/ Their goal is 100% voter turnout, something The Puppets definitely support! Don’t count on someone else, vote directly, vote for your choice! And always, always Vote Love! EVERY vote matters, each and every one! It may feel that yours doesn’t, but... too many times, elections are “too close to call” - one election a year ago was separated by one vote. ONE! EEEK! We know how exhausting this whole political climate is, it is for Puppets, too. We suggest you read our suggestions from 2017, it all still applies, even more so. We. Can. Do. This! With your help, with your vote, We CAN! VOTE! VOTE LOVE! !